The Great Pyramid Of Giza Was The Tallest Structure Until Dethroned By A? The Great Pyramid of Giza was, at the time of its construction, the tallest man-made structure in the world. Constructed over a 20-year period and completed in approximately 2560 BC, it towered at an original height of 480.6 feet over the Egyptian desert (erosion, over time, has shaved that height down to 455 feet). Centuries upon centuries of erosion or not, for a staggering amount of time—nearly four millennia—it remained the tallest structure in the world. 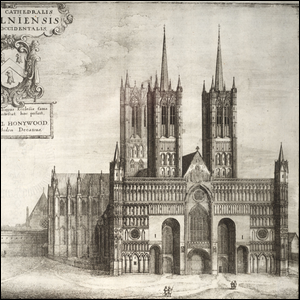 It wasn’t until the completion of the Lincoln Cathedral in Lincoln, Lincolnshire, England, that the Great Pyramid was dethroned. The cathedral was completed in 1311 AD and the top spires of the building stood around 44 feet taller than the Great Pyramid. For nearly six centuries, the tallest structures—like the Pyramid and the cathedrals that followed—remained religious in nature. After Lincoln Cathedral, the title of tallest man-made structure fell upon a series of churches including St. Mary’s Church, Notre-Dame Cathedral, and Cologne Cathedral, among others. The first structure to break the streak was the Washington Monument, erected in 1884 at 555 feet tall—although you could easily argue that while not religious in nature, the monument was certainly a construction made in deep reverence of something. In 1889, however, we see the remaining shift away from religious constructions towards more modern record-setting buildings. The construction of the Eiffel Tower in 1889 set the record for the next 41 years until the first skyscraper ushered in the age of cloud-grazing constructions. The Chrysler Building (1,046 feet) stole the title from the Eiffel Tower in 1930. The Empire State Building (1,472 feet) stole it one year later in 1931. In 1967, the Empire State Building was unseated by the Ostankino Tower (1,772 feet) in the Soviet Union, and 8 years later that tower was unseated by the CN Tower (1,815 feet) in Canada. The CN Tower held the title for 32 years until the construction of the Burj Khalifa in the United Arab Emirates, which, at a shockingly tall 2,722 feet, will likely hold the record for tallest man-made structure for quite a while.